My parents and I often had supper in Henry Beach's cottage on Long Lake. Mr. Beach was a detective on the Flint Police Force. His cottage was near to Cusic's a Flint Real Estate broker and father of Jackie Cusic who became famous as a midget wrestler. 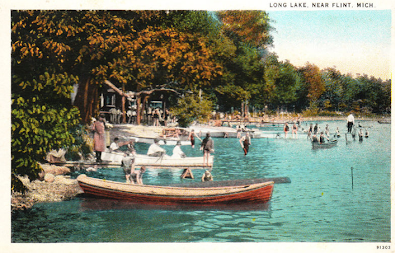 It was a great lake then and the small public beach and bar were the destination of many of Flint's teenagers. My parents both grew up and met on Lake Fenton. Our family still has the original small "cottage" that my grandparents bought back in the 40s. Yeah, we are now the ghetto of the former Long Lake. A while back The Flint Journal did a piece on a beautiful renovation across the lake from us. The article was titled "A million dollar view". We laughed at that. What million dollar view are they talking about? They're looking at us! We're the ones with the million dollar view. But seriously, the way I heard it, in an art-imitates-life, "Leave It To Beaver" episode fashion, attractive young women and good young men from "decent" families who had future income "potential" were invited along with the one percenters, or ten percenters, or what have you. Those were the ones who were invited to the best Long Lake functions in early-to-mid Twentieth Century Flint. Perhaps the pages of archived Flint Journal issues hold the information on who those people were. Case's Island is more or less in the middle of the lake. My paternal grandparents had a cottage there, and their large family (plus a lot of friends) spent many summers there. They were well acquainted with Charley Case, the island's namesake. Quite a bit of home movie footage was shot on the island in the '30s, featuring the island's busy social calendar including outdoor pot luck suppers for the whole island, softball tournaments, sailboat races, construction of shuffleboard courts along Chestnut Lane and a public swing in the park, and so forth. My Dad and I edited those movies onto a DVD, which is available through the Fenton Historical Society. One of my uncles married a daughter of another Case's-Island-cottage family (the Townsends...definitely 1%-ers), and that family gave them the family cottage as (I think) a wedding present. Another uncle had a new cottage built on a small piece of open land across the island's circumferential "road" from my grandparents' cottage. Eventually, my Dad and Mom took over my grandparents' cottage. I spent part of a number of summers out there. It was a great place...but then again, I was a kid, and my parents naturally did their best to make sure that I only had fun experiences. Cottage summers became less important, though, when the Salk polio vaccine first became available. Parents' fear of polio--a terrible crippling disease of young people--was a key reason why people who could afford to, spent summers out of cities...because polio seemed to be contagious only in cities. After the polio vaccine conquered that disease, cottages had to be fun enough to justify the extra work-commuting (especially significant for Case's Island, accessible only by boat even when the weather wasn't cooperative), the "semi roughing it" lifestyle, the dual housework, and the taxes. A major fire on the island in the 50s took out several cottages, which highlighted that even though island owners had always paid normal property taxes, they didn't (and still don't) get any fire or police services, or have ready access to emergency medical care. My parents eventually sold their cottage, as did my uncles. But, for some families the pull of island/lake living is stronger than others. One of my cousins bought an older cottage on Case's Island a number of years ago, then bought my parents' old cottage next door (which he had to tear down...light cottage construction isn't a good match for 70 years of a damp lakefront environment, and the intervening owners hadn't maintained it structurally) for "buffer" land. Another cousin recently bought another cottage...actually, a home...on the island. I've always wondered how Case's Island got deliveries... (furniture, appliances, food). It always sounded like a hassle, but fascinating when I was young. As a kid I once skated across the lake to the island and back. There are a lot of mansions on Lake Fenton now. Maybe someday (if the housing continues to plummet) they'll become bed and breakfasts or assisted living facilities. They seem too big for the lake otherwise. Everyone there has one or more small boats, of course. People mostly have always brought over their own groceries. And "small" boats are a lot bigger and greater-capacity, and faster, than they used to be. And, a lot of people have "pontoons" as boats; they have a *lot* of carrying capacity, if you're up to doing stuff for yourself or helping out a friend. There's always been plenty of neighborliness on the Island. At least one person provides various commercial services on the Lake as part of his Fenton-based general-services business, including heavy hauling, dock put-in/take-out, and so forth. On at least one occasion, he's had a backhoe on the Island, along with a couple of golf carts and probably other equipment, and he regularly hauls construction materials, so a sofa or refrigerator wouldn't be a big deal. Back in the late '30s, someone operated a grocery boat on the lake. It periodically circulated around the shore, as a sort of floating convenience store. It regularly stopped at the Island. That was part of a slower, more relaxed period, of course, when the lake itself probably seemed farther from civilization.